For the US Army in Iraq in 2003, every Soldier had to be a nation-builder. There was simply no other agency that had the resources, organization, manpower, or willpower to even consider attempting the overall task of reconstruction. At times, the adoption of CMO by a wide variety of units such as aviation battalions did lead to problems in coordination. Major Chris Bentch, a CA officer who served in 2003 as the Civil Affairs Staff officer (S5) for the 3d Brigade Combat Team (BCT), 4th ID, noted in his journal that by late June 2003, CMO in the Sunni Triangle lacked coherency. Bentch described the situation as “a CA nightmare as everyone is doing CA and no one knows what everyone else is doing.”28 Bentch and staff officers like him in the brigades and battalions took on the task of channeling this energy and the resources available into directions they believed would benefit the Iraqi people and further the Coalition project in Iraq. However, the Coalition’s lack of an overarching plan for reconstruction meant that all of these early efforts remained essentially local initiatives not implicitly tied to larger strategic goals. Cognizant of the need for funding at the tactical level, CJTF-7 took a significant step forward in June 2003 in its development of the Commander’s Emergency Response Program (CERP), a new source of funds that would directly affect tactical-level reconstruction efforts. According to Colonel Michael Toner, CJTF-7’s Chief of Resource Management (CJ8), the driving idea behind the CERP was “to enable commanders to respond to urgent humanitarian relief and reconstruction requirements within their areas of responsibility, by carrying out programs that will immediately assist the Iraqi people.”30 The origins of CERP lay in a fortuitous accident. Soon after Saddam’s regime fell, Soldiers in the 3d Infantry Division (3d ID) found $700 million (US) hidden in a hole in the wall of one of the Iraqi dictator’s palaces.31 Toner and a group of innovative staff officers then reasoned that because CJTF-7 had no immediate funds available for reconstruction, part of the money discovered in the palace should be used to support projects at the local level. After verifying that the cash was not counterfeit, Lieutenant General Ricardo Sanchez, the CJTF-7 commander, asked Bremer for permission to use the funds for local reconstruction. Bremer agreed, and CERP began with approximately $178 million. 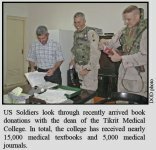 US Soldiers look through recently arrived book donations with the dean of the Tikrit Medical College. In total, the college has received nearly 15,000 medical textbooks and 5,000 medical journals. 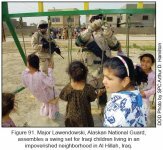 From the perspective of the US military, CERP funding was one of the biggest success stories in Iraq because the projects made possible by the funding program often appeared to have a direct impact on their ability to achieve campaign objectives. 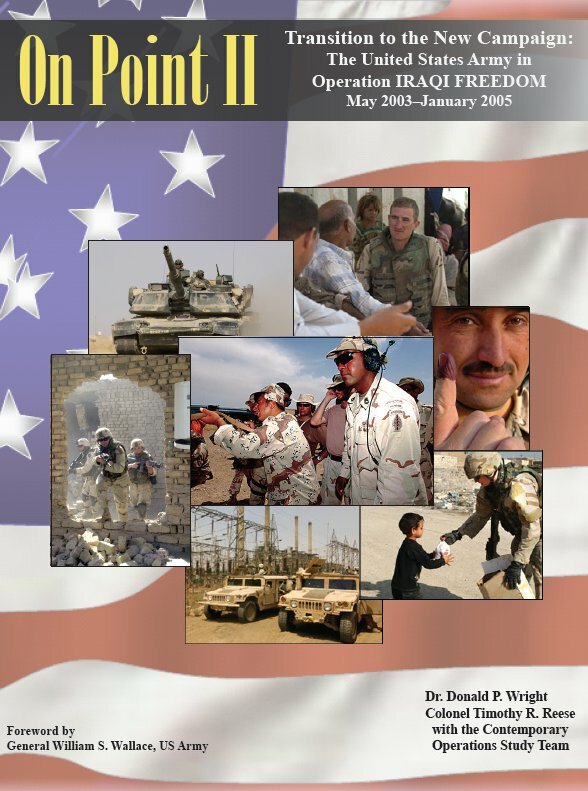 One 2006 study that examined the effects of the CERP asserted that many commanders noticed a direct correlation “between CERP funded projects and improved stability and security in their sector.”42 Lieutenant Colonel Brian McKiernan, the commander of 4th Battalion, 27th Field Artillery, 1st AD, used the number of attacks against Coalition forces and the number of actionable tips or information received from the civilian population as a metric for determining if progress was being made on reconstruction in a community.43 If attacks were down and tips were up, McKiernan then assessed ongoing reconstruction projects as successful.